There are 35 different cities and towns in the United States with the name "Franklin"; in this sense it is the most commonly used place name in the country. If you wished to visit every city and town named Franklin, what route would you take? 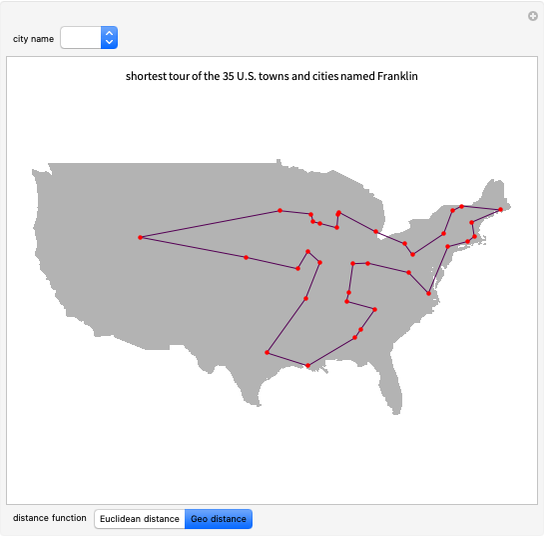 This Demonstration shows you the shortest tour of the Franklins, and also the shortest tour that visits any possible collection of 15 or more U.S. towns and cities that share the same name. Just select a name from the popup menu and a tour that visits the places with that name will be displayed. (The names in this menu are sorted according to how many cities and towns bear that name, so Franklin is at the top.) Mouseover any town on the map to see what state it is in, and to show its population. 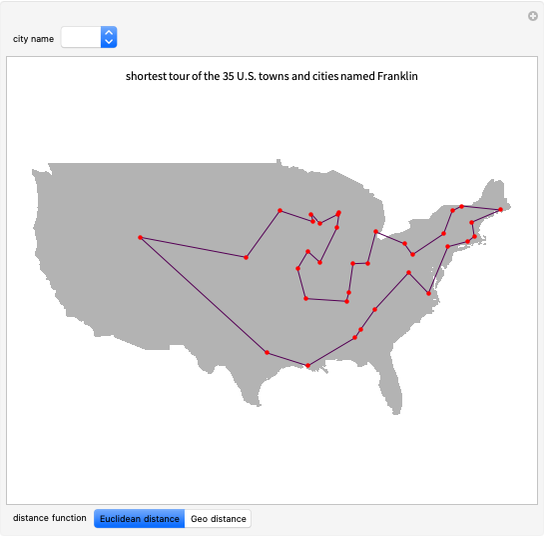 There are sometimes two distinct "shortest" tours, according to two different ways in which distances can be measured. Euclidean distance refers to straight-line distances between points on the flat map itself. Geo distance treats the cities as points on the spherical globe, and measures distances along the surface of the globe. Neither measure takes roads, mountains, or water into account. There are some idiosyncrasies. North Carolineans may be miffed that the Outer Banks community of Avon is not included among the 15 U.S. towns or cities of that name. This is because Avon, NC is technically not a town. It is but one community in Kinnakeet Township (despite roadsigns and a thriving summer population that suggest full citizenship in the "Avon" namesake). On the other hand, there are some very small communities, such as Ashland, OK with 53 residents, that are official towns. You may also notice that Wisconsin has the perplexing habit of using the same name for multiple towns—for instance there are no fewer than five Wisconsin towns with the name Franklin. The most populous city or town in these cases will show only its name, state, and population when moused over. The rest will add, in parentheses, the name of the county containing them. Bruce Torrence "U.S. City Tours"